Source­s say PML-N agreed to remain neutra­l follow­ing meetin­gs with Saudi royals. Former president Pervez Musharraf has chosen a vaguely familiar path to return to Pakistan from his nearly four-year exile, relying on the intervention of the Saudi royal family and its clout over one of his arch-enemies. Talking to The Express Tribune, a close aide to Musharraf – who is due to arrive at Karachi airport around 12:45pm today – revealed that following closed-door meetings with the Saudi royals, the Pakistan Muslim League-Nawaz has agreed to refrain from creating any trouble for the former dictator upon his return. He added that in light of the threats issued against Musharraf by the Taliban, the country’s security agencies would provide security to the former president. According to the aide, both PML-N head Nawaz Sharif and army chief Ashfaq Parvez Kayani paid visits to the kingdom recently to discuss issues pertaining to Musharraf’s return and the upcoming elections in Pakistan. Musharraf himself met the Saudi rulers as well on separate occasions, he added. PML-N’s top leadership has remained tight-lipped on the alleged deal over Musharraf’s return. Both Chaudhry Nisar Ali Khan and Khawaja Saad Rafique refused to comment on the issue when contacted. PML-N spokesperson Ahsan Iqbal, however, denied any deal with Musharraf and maintained his party’s stance remained unchanged. He claimed the former dictator had tried to use diplomatic pressure to meet Nawaz Sharif, but his request was turned down by the latter. “For his crimes against the nation and the Constitution, Musharraf must face charges in the court of law,” he said, adding that his party would have no objection if the former president was cleared by the courts. In his October 12, 1999 coup, Musharraf overthrew PML-N’s government and forced the party’s chief and then prime minister Nawaz Sharif into exile for nearly eight years. Despite this, the party still appears to have softened its stance with regards to the former dictator ever since its chief returned from his visit to Saudi Arabia. Talking to the media upon his return from Jeddah last week, Nawaz Sharif said that Musharraf, being a citizen of Pakistan, has a right to live in the country, and that it is against Quranic teachings to deprive a person of his homeland. PML-N’s new stance stands in sharp contrast with its previous hardline stance regarding Musharraf. The party had previously given the then ruling Pakistan Peoples Party a tough time for failing to prosecute Musharraf under Article 6 of the Constitution over his unconstitutional steps – his coup in October 1999 and his decision to send judges packing during his second martial law in 2007. Meanwhile, Ahmad Raza Kasuri, the senior vice president of Musharraf’s All Pakistan Muslim League (APML), confirmed a deal with the PML-N. “If no such deal had been made, then why was Nawaz Sharif citing divine verses in favour of Musharraf’s return,” he asserted, when contacted by The Express Tribune. Responding to another question, he said that as per the ‘blue book’, security agencies were bound to provide security to a former head of state. According to Inspector General Bani Amin, however, the usual security protocol consists of five police personnel. A former federal minister, however, told The Express Tribune that under the deal struck with Saudi intervention in 2008 with the army chief as a guarantor, the government was bound to ensure Musharraf’s security when he chose to return. The PML-N joined the government under the same deal, and was, in return, supposed to give the former president indemnity. Under the deal, the chief ministers of the subsequent government were also supposed to take oath under Musharraf, the minister continued. He added, however, that the PML-N chose not to honour this commitment fearing public backlash at the time. This, he maintained, led to the former president’s decision of choosing self exile. The Tehreek-i-Taliban Pakistan (TTP) have threatened to kill Musharraf once he returned to Pakistan. 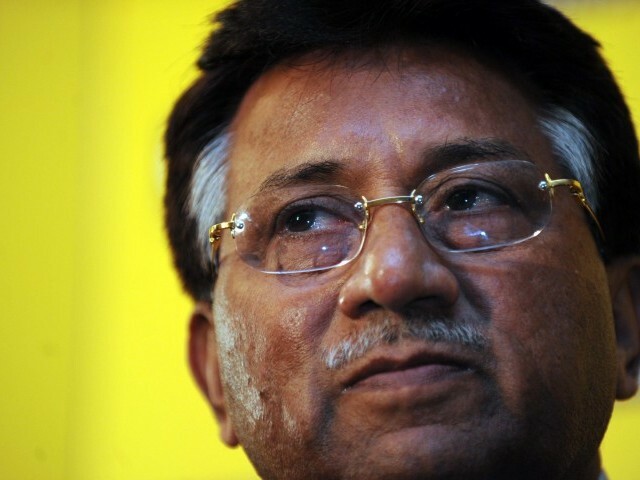 In a video message released on Saturday, TTP operative Adnan Rasheed – a former Pakistan Air Force technician who was involved in the attempt to assassinate the former president during his tenure – said the group has prepared a special force, comprising snipers, suicide bombers and a special assault team, for the sole purpose of killing Musharraf. Rasheed had previously been imprisoned in Bannu jail after being sentenced for masterminding the attacks on Musharraf. He was freed by the Taliban in last April’s brazen assault on the prison. Published in The Express Tribune, March 24th, 2013. Musharraf says he is not scared of 'hollow threats made only with words'. In video message, TTP says they have prepared a special squad of suicide bombers, snipers and a special assault unit. Senator Raza Rabbani says ex-president Pervez Musharraf should be tried for treason charges. A former technician…!! Are there any presently serving as well..??? long live musharraf! people who say war on terror is not our war need a reality check!!! TTP and other militants groups are killing people in lahore, karachi, islamabad, quetta, not chicago, NY or texas!!! we need musharraf! mian sahib have imported ideas, sometimes from saudi as well.. welcome home mr mush. hope you wil also get election ticket from PML N as well. It is too early to comment as what is been cooked up behind the doors. The statements of various political leaders would reveal what was the truth. Nonetheless, The Sindh High Court has granted bail to General Musharraf, he has all the right to take part in the politics and contest the election. I have heard that many people are going to Karachi Airport, just to see a glimps and welcome General Musharraf. Wow.. The cat is out of the bag. It is against Quranic teachings to deprive a person of his homeland … lolzzzz how Nawaz has changed his stance. Typical, only PTI is not in the pockets of KSA, UAE, USA or any other foreign power. Things are so rapidly changing… world and the Pakistanis knows that Musharraf is the only way to bail out Pakistan from the current crisis. A brave man. Pakistan need the likes of him. A country whose ex-president requires permission from a 3rd county to return to his own country that he once ruled for ten years! where is sovereignty? Just shows how 2 faced PMLN is. They have done a deal with Musharraf and won’t admit to it. How typical of a party that is opportunistic and has no principles. When did the Saudis became our masters? Enough of the interference of the House of Saud in our country. Let us pray for the safety of Pervez Musharraf as he returns to his country. The Commando is not the brightest of individuals but he is a former President. Why he wants to enter Pakistan now is beyond me! He should have his day in court and the opportunity to defend himself. Not foreign ‘powers’, but most of its funding doesn’t come locally either, it comes from overseas Pakistanis, who will have a lot of say in the party’s affairs. But I suppose that’s a good thing – most of them are educated people who also want a better image of Pakistan. When has PML N demanded before that Musharraf should not return that now you are accusing PML N of changing it’s stance? However, PML N has always maintained that Musharraf should be tried by courts and this stance remains unchanged and in all fairness it is not an unfair demand. How can you say that PML N entered into a deal with Musharraf? PML N has conveyed to Saudia that it won’t object to Musharraf’s return. Do. PML N has never objected to Musharraf’s return and after meeting the Saudis this stance has remained same. There is no question of there beng a ‘deal’. What Nawaz Sharif said regarding Musharraf’s return can only be labeled as a decent and noble statement. Every Pakistani has the right to return to Pakistan and take part in elections. No one should be denied return to his homeland. However, compare this with what Musharraf did when Nawaz Sharif and Shahbaz Sharif were trying to come back to Pakistan? They were not even allowed to attend their father’s funeral on technical grounds that they signed a document not to return for 10 years. Can a document deny a citizen to return to his country which is his constitutional right? Today the same Musharraf who ousted a demoratically elected government unconstitutionally, formed a new party by hook and crook and who coerced the elected Prime Minister of the time to banish into a diffent country is returning. Anyways Musharraf should be alowed to return to Pakistan and how he treated others he should not be treated the same way. Saudis have conferred highest Civil Award to Musharraf.. I think it was received by two Pakistanis till to date, Musharraf and Farman Ali. Also, the Musharraf has the blessing of entering Khana Ka’ba twice when he was president. So it is understood that Saudis won’t let anyone create trouble for a person to whom they have given the highest civil award. Pakistan can no longer afford to be a satellite State of Saudi Arabia and China. The relationship with one will only bring increased religious extremism, the relationship with the other can only increase Dictatorial tendencies which the country already suffers from. An independent Foreign Policy not servility will serve the country better in the long term. You know a nation has lost it, when fate of its leader’s is decided in another country. It has been Pakistan’s perennial problem. It always needs crutches – US, China,Saudi. When will it learn to stand on its own feet? Nawaz Sharif has sold his soul to the Saudis. How would he stand up to them and tell them to stop funding terrorists in Pakistan. Second, his business interests are in Britain. That’s a shame. Good to c all criminals assembling in country. Once caliphate is established, all of these criminals will be seized by the will of God. PPP and PML N had to return the favours to him. He let them back so they had to let him back. He did NRO with them so they had to do the same.And of course it always happens with help of Saudis. khadieja: -- There is no restriction in day dreaming. May God save us and the world from the saudis. Only in Pakistani politics. Its amazing how much influence and direct control Saudi Arabia exercises over Pak political parties and the Pakistan army. Its like a state of Saudi Arabia. p r sharma, review your previous 1000 years of history to assess what is plausible and what is not. You have had 20 good years out of the last 1000. Underestimate us at your own peril…. PMLN is badly exposed once again after this deal. Don’t compare beliefs with deeds. We share only beliefs with them but our wrong interpretations and wrongful deeds have made our rulers to be dictated by them. Sire, it wasn’t people from present day Pakistan that ruled India for a long period. I will not go into the 1000 years myth which has been debunked several times but continues to show up. unless of one is convicted by some component court. Musharaf is son of Pakistan, exactly as like yourself. I hate his acts of past, try him if you can, then if law of the land say, that he criminal, then shout it loudly and I will join you.